Just in case I still have any readers who are still vaguely interested in my Residency, here’s an update. It’s really hard to believe a whole year has gone by since I wrote my last post! At that stage, I had the best of intentions to totally complete all my unfinished projects ASAP. Early in 2013, I told myself that I needed some down-time … but really … twelve months is a bit excessive! I said at the end of 2012 that it had been my ‘annus prodigiosus’, so in that case 2013 has been my ’annus inertiae’! Even though these eleven hangings had been completed for display by the end of 2012, I wanted to ‘finish them off‘ by securing the squares to their backing. Rather than hand or machine stitching elaborate quilting designs, I decided to tie them. I stitched colonial knots in gold thread in each corner. These ‘golden knots of friendship’ symbolised my links to the 355 people who had so kindly made flowers for me. It actually took quite a while to sew all of those one thousand, nine hundred and eighty knots! 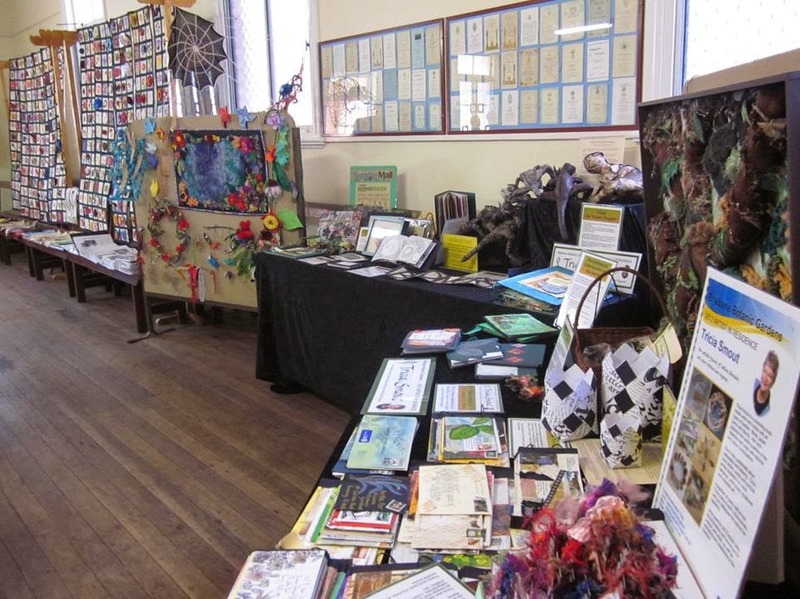 During this year the hangings have been travelling round to various displays and presentations (see below) and they have been greatly admired. I’m still in the process of finding a prominent, easily-accessible venue where they can be on permanent display so that all the contributors, as well as members of the public, can see them. I’d like them to stay together, so if anyone has contacts in high places (council, government, public buildings) please put in a good word for me. I have composed a flyer to send out for Expressions of Interest, with which I would include an accompanying letter. 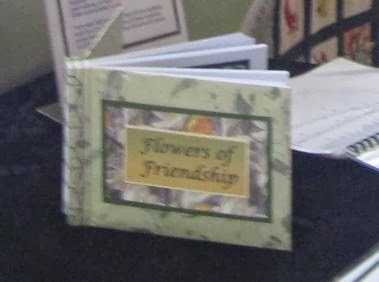 I’ve now made a book about this “Flowers of Friendship” collaboration which describes the project from its initial beginnings, through the construction process to its culmination. It has photos of each flower and the names of all the contributors. I hope to make more of these books, and give one to each of the craft groups who supported me. 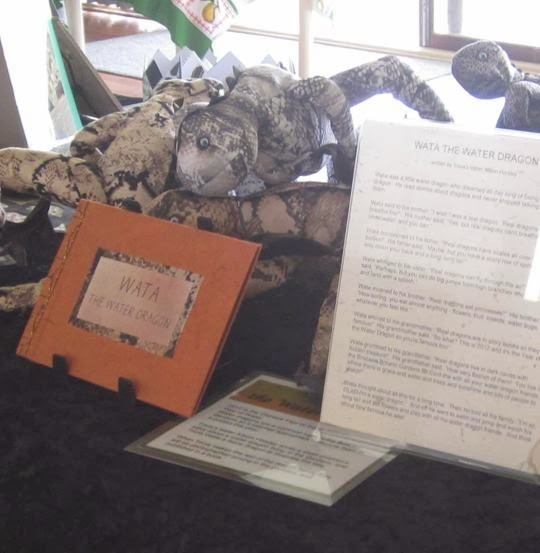 2012 was the Chinese Year of Water and also the Year of the Dragon. It was also the Year of Reading and the Year of Cooperatives … so right at the beginning of my residency year I decided to make a collaborative book about Mt Coot-tha’s ubiquitous water dragons. 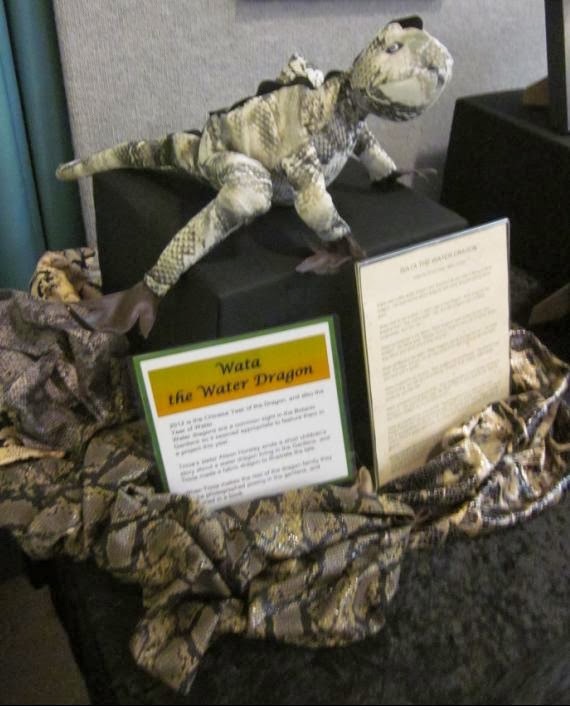 My sister Alison Horsley wrote a children’s story for me in March, but by the end of 2012 I had only made one of the seven water dragons, and the rest remained as pieces of fabric. The other six family members are now completed. There are three more the same size as the first one, and also three smaller ones. The original one has now become Grandma! They have been photographed in pairs to illustrate each page of the story. 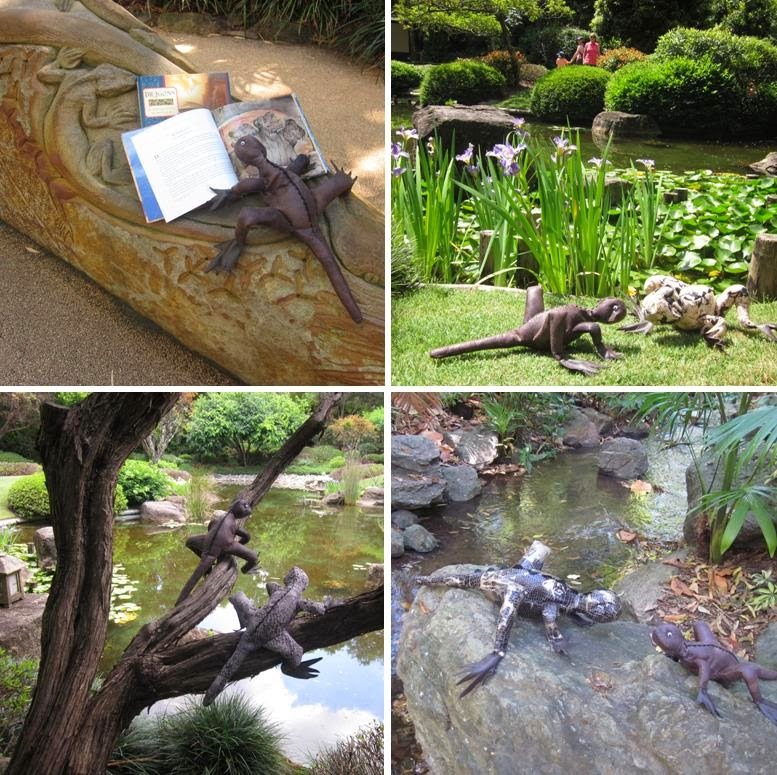 While Alison was helping me photograph them at Mt Coot-tha, a real water dragon chose to get into the act! I have now made a prototype of ‘The Book’, which will eventually include the pattern and instructions for making the dragons, finger puppets, facts about water dragons, and much more! Ideally I would like to find a commercial publisher to get this story to a wider audience … so any contacts in the publishing field would be most welcome! In January 2013 I made a small quilt using the left-over fabric and flowers from the "Tropical Profusion" garment that had been created for the Catwalk Botanique fashion parade during my residency. 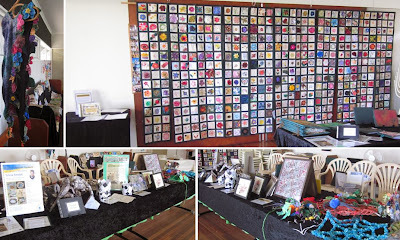 I made the quilt as an entry in the Queensland Quilters ‘State of the Art’ competition, but it wasn’t accepted! 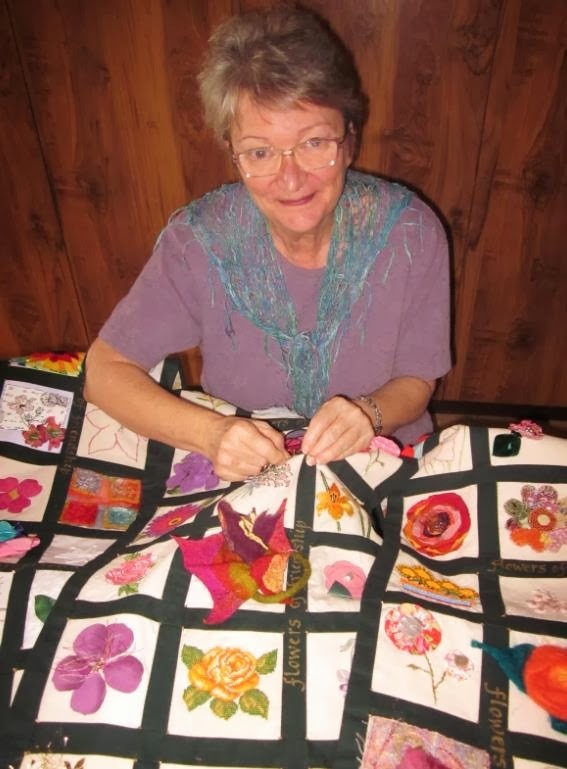 However this rejection was a blessing in disguise, because the quilt was then available to be included in my various talks and displays during the year. Dear Gay died on Christmas Eve, so these will always be special treasured memories for me. On New Years Eve I farewelled 2013 by watching eight of my garments modelled at a fashion parade. The "Tropical Profusion" garment was one of them. What an honour to be featured on a big screen watched by 10,000 people at Robelle Domain at Springfield (even though it was only a two-minute slot in the many hours of music, dance and fireworks!). Channel 10 was there all night filming footage for “The Project”, so there was a real buzz in the air. Another garment shown in the parade was a collaboration with Jolanta Szymczyk. This outfit was inspired by the origami flowers I had made for the "Floral Folds" project during the residency (image below on left). 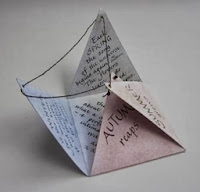 This time the folded paper flowers were attached to a large collar on a felt dress made by Jola. 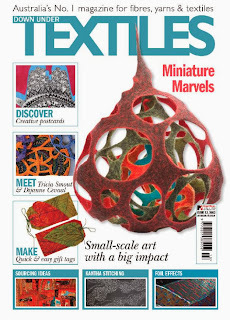 In the current issue of the Australian magazine “Down Under Textiles” there is a six-page story about my creative journey. What a privilege to be featured in this prestigious magazine! As well as images and descriptions of some of my residency projects, there are photos of some of my other artwork. 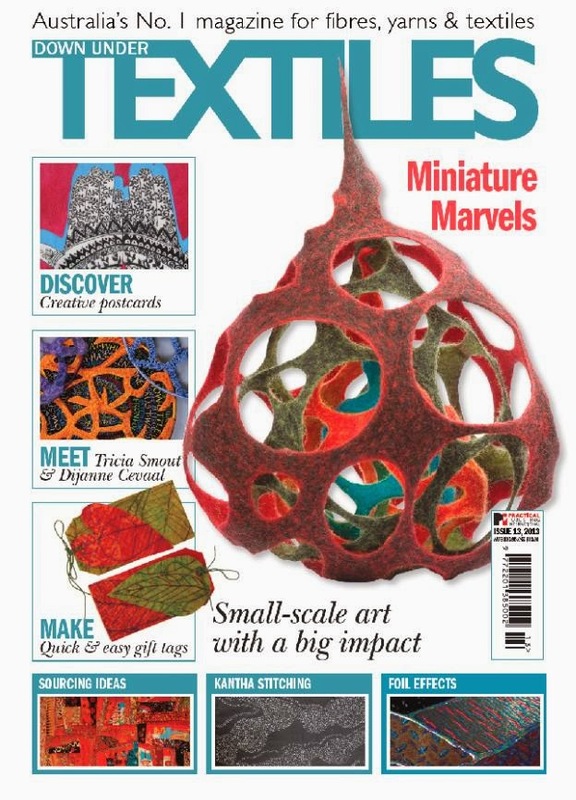 Issue 13, December 2013 is in the shops now. 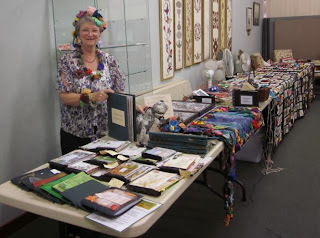 In February I was invited to be the Guest Speaker at the Qld Embroiderers' Guild half-yearly AGM. 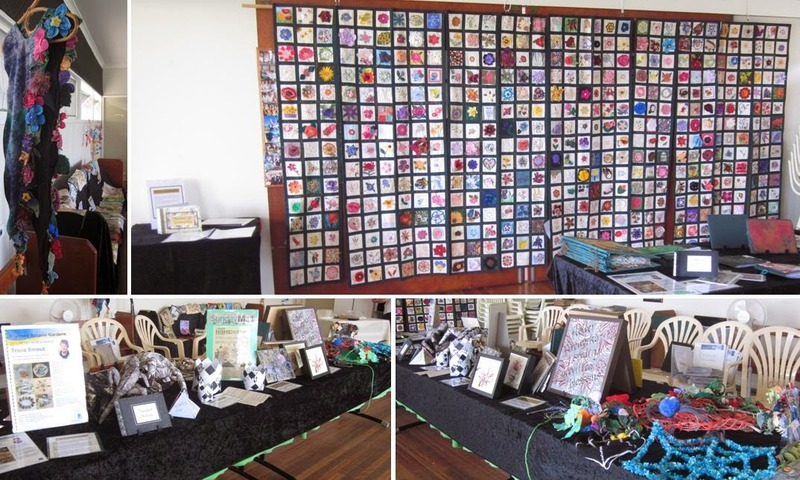 Many of the Guild members had made squares for my “Flowers of Friendship” hangings, so it was a great chance to show them the finished results and thank them for their beautiful contributions. They seemed to enjoy seeing my slideshow of all the other activities from 2012. 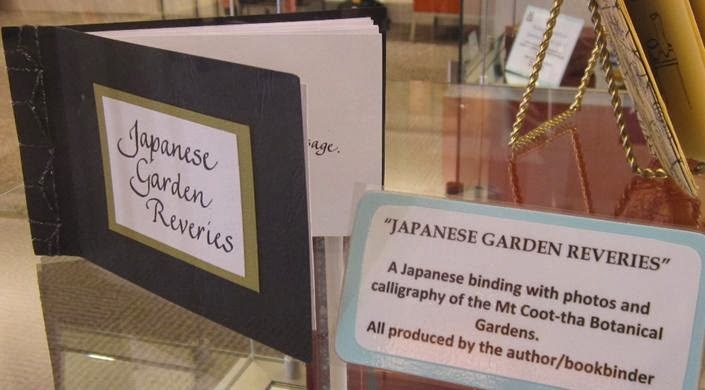 After much positive feedback from my display at Toowong Library during the residency, the staff invited me to do a retrospective display in March 2013. I managed to squish quite a lot into the two cabinets. promote the resurgent interest in hand crafts. 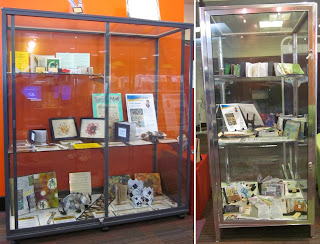 at Inala I presented a slideshow of my residency, as well as a display of my work. at City Hall I mounted a large display on both sides of the Ann Street foyer. 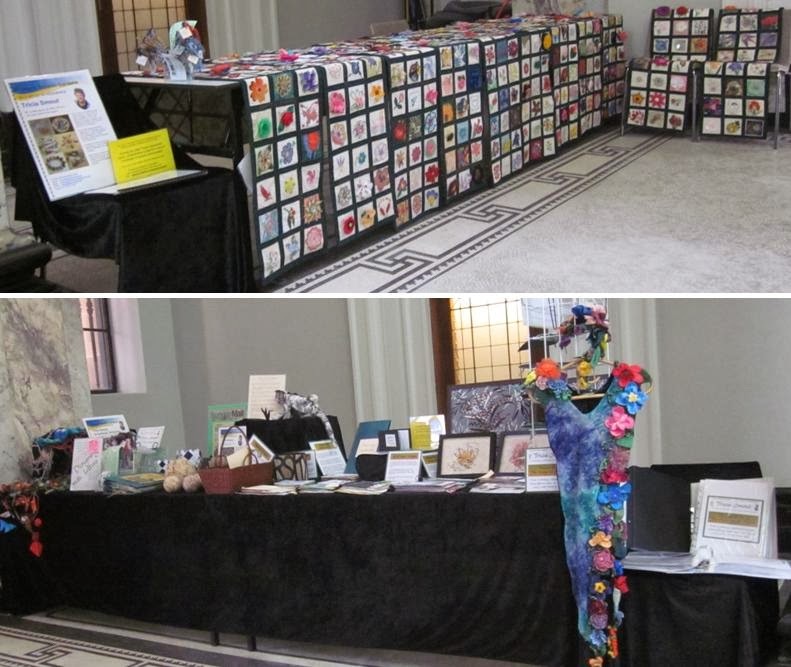 I put the “Flowers of Friendship” hangings on tables on one side of the room and set up a display of many other projects on the other side. I also had a table in the Sherwood Room for the ”Fragrant Flags”. I spoke to lots of people during the day. It was a real buzz! at Hamilton I had a prime spot in the foyer of St Augustine’s hall for my display, and I had a chance to speak about the residency in one of the ‘feature artist’ slots during the day. at Northgate, as well as displaying my residency projects on tables, we managed to drape the hangings on stands as a backdrop for the interview area. In August I was invited to speak at a meeting of the Sherwood Stitchers. Many of these ladies had made flower squares for my hangings. Many members of ATASDA had contributed to quite a few of my residency projects, so this was a great chance to show the finished results to those who hadn’t managed to visit my 2012 exhibitions. In Brisbane, at the meeting in September, I had AV facilities so I was able to show my slide presentation. 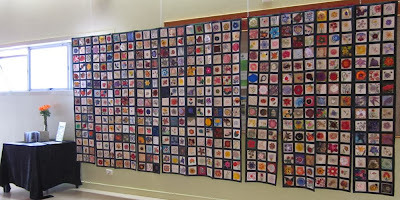 I hung the flower quilts on the windows, and displayed other pieces around the room. In Toowoomba I spoke about my residency at the ATASDA meeting in October. 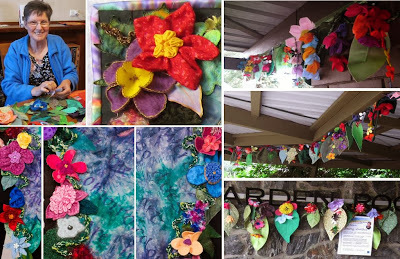 In November I had the pleasure to finally meet the six ladies from the local area who had made flower squares for me, and show them the finished hangings. Members of the Rainbow Beach Craft Group and the Tin Can Bay Quilters and Craft Club welcomed me and enjoyed seeing some of the projects. 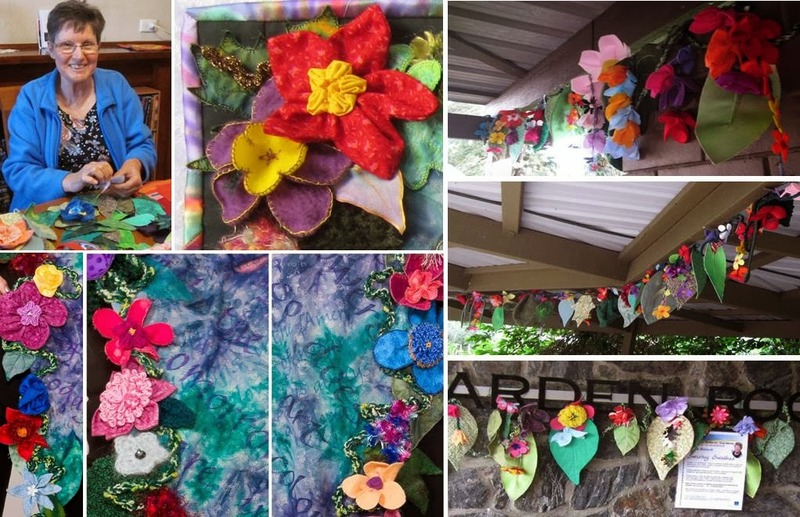 In November I had a sense of déjà-vu as I hung “Flowers of Friendship” in the Auditorium at Mt Coot-tha. It was almost a year-to-the-day since their last appearance there (during "Floressence" 2012). 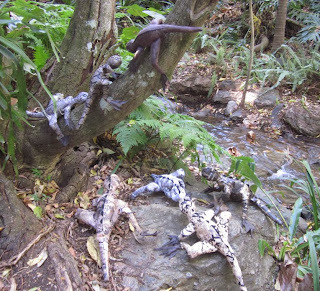 In December I set up a display under the Administration building at Mt Coot-tha, using the Swishy Swathes (which are still hanging there) as a backdrop. This was a great setting for filming a segment about my work, ready to be screened during the fashion parade at Springfield on New Years Eve. Zela Bissett’s exhibition at Gatakers Artspace in Maryborough in January was sub-titled “Visions of the Natural World” and she invited me to display the nine books created in the “Environmental Exhortations and Elucidations” project. In each of these books I had hand-lettered well-known sayings (by environmentalist John Muir), and I had invited other collaborators to creatively decorate these pages. In early March “Fibrefest” was staged in the Auditorium at Mt Coot-tha. This is the biennial exhibition showcasing work by members of Queensland Spinners, Weavers and Fibre Artists. 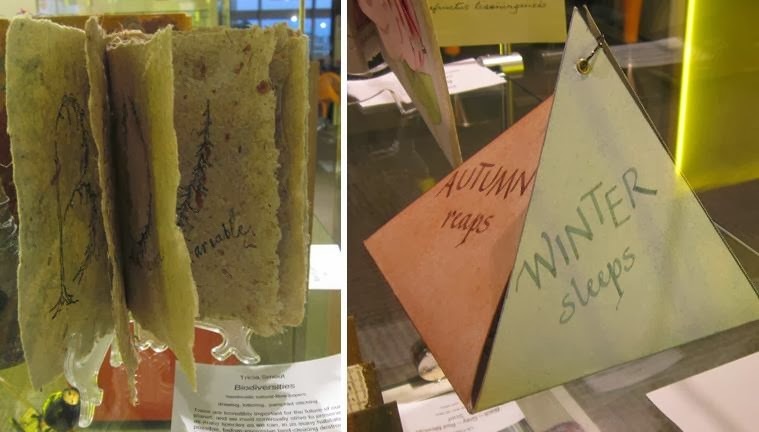 In June, at Gallery 159 at The Gap, there was an exhibition of works by tutors from the Textile Art Academy. I included some of my residency works as part of my contribution. “Japanese Garden Reveries” was in the display cabinets at both Carindale Library and Brisbane Square Library in August and September. 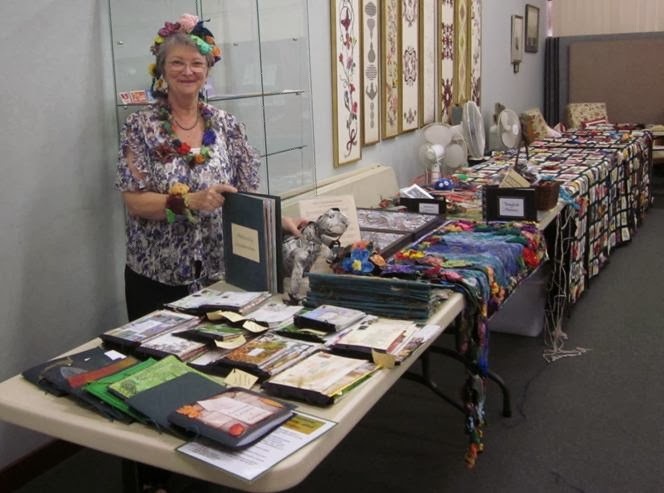 This exhibition by members of Queensland Spinners, Weavers and Fibre Artists was at Matthew Flinders Gallery, Bribie Island in August and in Brisbane Square Library in September and October. 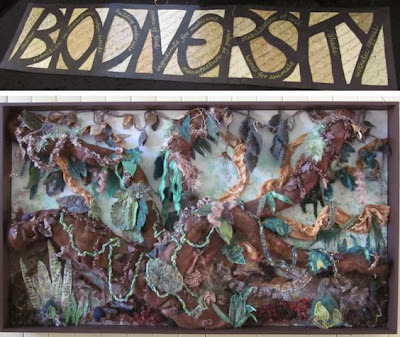 Two of my residency works “Biodiversities” and “Seasons” were on display. In September/October my “Seasons” book was selected to be in this 8th Annual Artist Books Exhibition at 'Artisan Books' in Fitzroy in Melbourne. 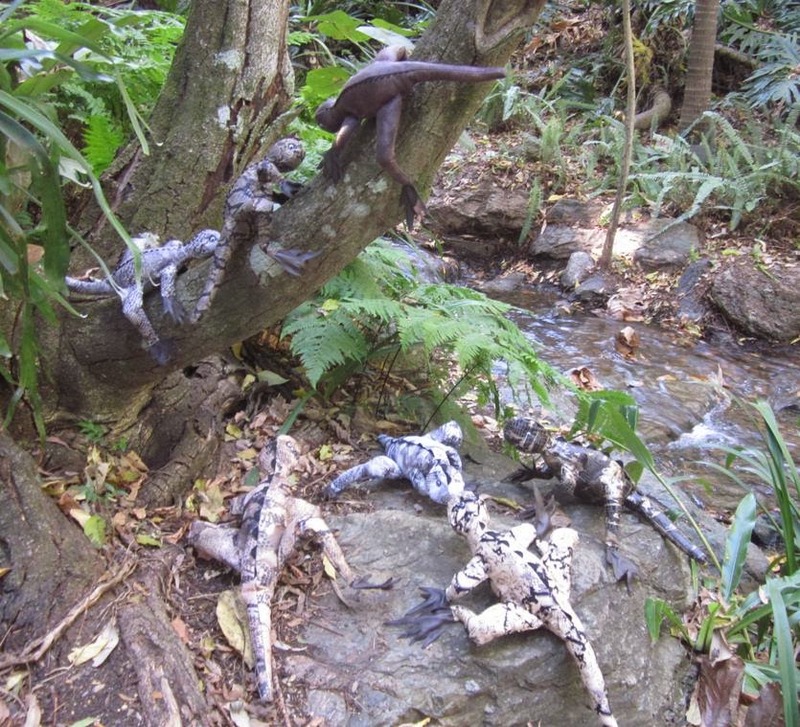 These two pictures were accepted as finalists and were displayed in the 2013 Moreton Bay Art Awards at Strathpine Gallery in October … but they unfortunately they didn’t win, or get sold! 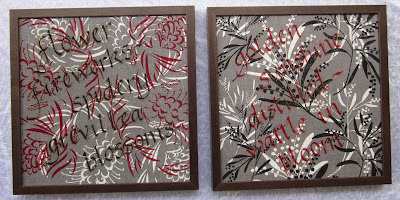 In this collaboration my friend Helen King screen-printed fabric with her elegant wattle and grevillea designs (from her Paluma Prints range). 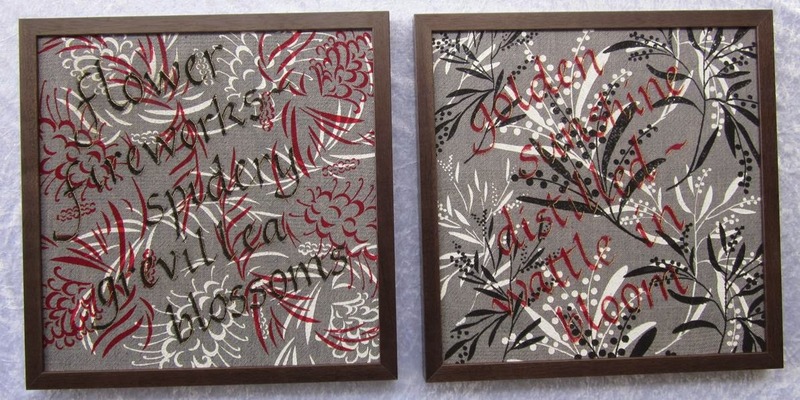 My sister Alison (author of the Wata story and the Japanese Garden haiku) composed the poetic phrases which I hand-lettered and embroidered. I am still in the process of making a folder (or two or three) to present to the Gardens’ staff as a record of my residency. This will document what I achieved through the year (as well as all this ongoing follow-up). Having said, at the beginning of this post, that I didn’t feel I’d achieved much in 2013, compiling this summary has actually been quite therapeutic, and it has cheered me to think that I did achieve some things after all! In 2014, I will endeavour to …. Tidy up my ‘creative chaos’ … unfortunately my lounge room still looks much the same as in that photo from a year ago, so obviously my first 2014 New Year’s resolution should be to actually do something about that (but it's more fun to do other things!